One of the eatery’s shops in Hull, UK planned on holding a “Krispy Kreme Klub” meeting on February 18 this week, and an advertisement for the event quickly caused a commotion among social media users who were weary that “KKK Wednesday” might be less of a snacking adventure and more of a hate-filled happening endorsed by the other KKK—the Ku Klux Klan. “KKK Wednesday” was advertised on the same Facebook posting that contained information about “Face Painting Thursday” and “Board Games Galore” scheduled for this weekend. Representatives for the chain were quick to yank the promo from the Hull location’s social media profile, but not before it was posted for the whole internet to see. “All material has been withdrawn and an internal investigation is currently underway,” Krispy Kreme told the Mirror Online. “Krispy Kreme apologizes unreservedly for the inappropriate name of a customer promotion at one of our stores. This promotion was never intended to cause offence,” the company said in a statement. Meanwhile, the Mail reported that a Krispy Kreme exec confirmed that this week’s event will happen as planned. “We don’t have a new name for the event yet but it is still going ahead this week,” the spokesperson said. 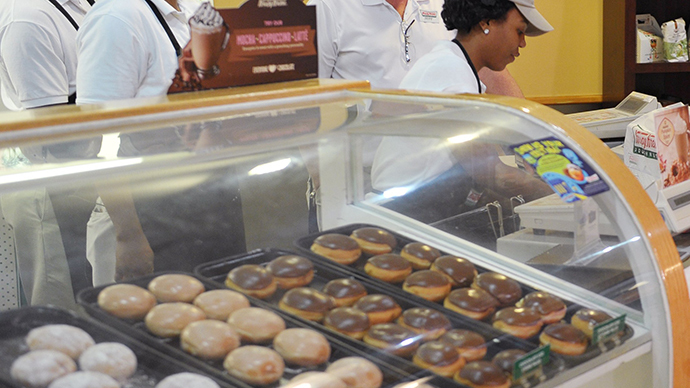 Krispy Kreme got its start in Winston-Salem, North Carolina and has since spread to nearly two dozen countries, including Australia, Bahrain, South Korea and the United Kingdom.